Okay, so you've watched The Karate Kid so many times, you can recite every line from memory. And after seeing the fight scenes over and over again, you've actually become pretty good at karate yourself. But, does it still feel like you're not the best Karate Kid fan around? Show those other fans no mercy by donning our exclusive Karate Kid Cobra Kai Jacket! You have to admit, even though Johnny was technically one of the bad guys in the movie (though mostly because his sensei was a jerk), he was really good at karate. It's too bad Johnny and the rest of the Cobra Kais didn't have an honorable instructor, like Mr. Miyagi. If they did, they might have ended up as a friendly gang of martial arts misfits, instead of the bunch of bullies they were trained to be. We hope Johnny would still wear his killer red dirt bike jacket if he were a good guy, even though it is kind of a bad guy look. 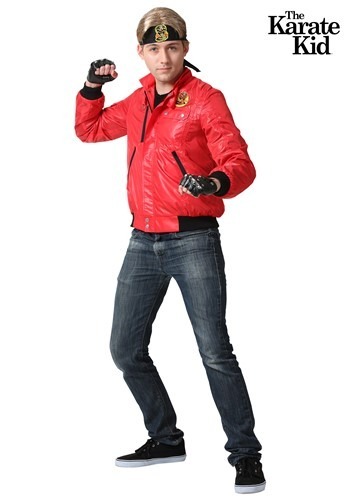 Luckily, nobody will be telling you to fight dirty or "sweep the leg" when you're sporting this wicked fire-red jacket (if they do, they will just be quoting the movie), but you'll still look as rad as Johnny. It even features an embroidered Cobra Kai dojo patch above the breast pocket, just like the ones in the movie. It'll give you the edge you need to win the Karate Kid costume contest with honor, and then you'll be the best around, nothing's gonna ever keep you down!